This week, we spoke to designer Melissa LaBarre, who creates versatile, accessible knitwear for the whole family. Learn more about her story and her inspiration. These days, I’m squeezing in knitting time whenever I can. If my kids fall asleep in their car seats, my neighbors have to watch me knitting in my car in the driveway. I knit at the kitchen table while I drink my coffee, at playgroups, at the library while my girls look at books and play, and in bed when I’m too afraid to move it to the living room because the creaking stairs might wake my kids up too early. I knit while my girls are engrossed in some form of imaginative play, like pretending to cook for each other, or taking care of their “babies”. So, it was it was a proud moment for this knitting mother, when I found them sitting side by side with balls of yarn, pretending to knit, one day. Maybe I’m raising future knitters here? I first learned the very basics in 1995, when I was 20 and working in a local nursing home, doing activities with the residents, several of whom liked to knit. I relied a lot on having other people help me cast on and bind off, and, after a few winters of knitting garter stitch scarves, I gave it up for a while. I picked it up again about 12 years ago, taught myself everything I needed using books, and I haven’t put it down since! That’s a wonderful way to learn to knit: with a combination of watching experienced knitters, and reading books. After you expanded your skills, when did you start to design, and why? When I started knitting again, I guess I was more fearless with it. I started figuring out how to knit garments, and was just using numbers I had figured out, based on gauge. It wasn’t until my friend Cecily Glowik MacDonald encouraged me to start writing everything down, that I realized I was “designing” something. 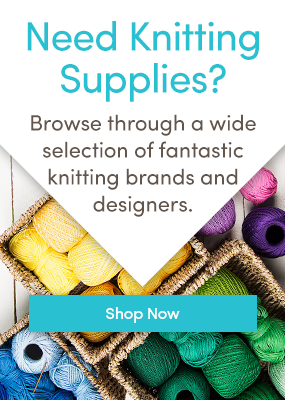 I had a pretty active knitting blog back then, and through it, I started getting asked to submit ideas to a few places. That’s pretty much how my hobby slowly evolved into my job. Since having my daughters (in 2012 and 2014), I started designing a lot of baby and kid knits. I really love making tiny cardigans, it’s so much fun to finish a garment so quickly, and it’s a fun way to experiment with new ideas on a smaller scale. Also, my girls are nearly 2 and 4 and keep me very busy, so I get to accomplish 3 things with kid-centric designs; I get to spend more time with my girls, make more things for them, and, hopefully make a modest living. If you have any time to knit for yourself, what do you make? Being a full-time work-at-home mother, I honestly never have time to knit for myself. But, I am lucky enough to do regular design work for a few companies that later return my hand-knit samples to me, so when I design women’s sweaters and accessories, I definitely try to make things that I’ll enjoy wearing in a year or so, when I’ll get them back. Oh, I’d definitely be one of those hard-wearing, scratchy wools. Love the stuff! To see all patterns designed by Melissa LaBarre, click here. Love inspiration? Follow us on Bloglovin’! Last updated: February 18th, 2016. Just downloaded the Babe in the Wood cardigan such a simple design I am sure I will love knitting it. have you got melissas lovely hat pattern that she is wearing and the leaf girls one?